We loved the location and especially loved the washer / dryer in the unit. great location and very convenient. All stuff friendly and helpful. I will choose this hotel again. Very good location, breakfast is good, bed and bedding is comfy, kitchen is well equipped. But room is small without any sofa chair, bathroom door has blood stains on it. We staying that hotel for 4 nights ,overall is good, but no wifi, I told to the frent desk's clerk still not soveing. The hotel is under some renovation but the kind staff have help us have the best possible room to get comfort and quietness!! We thoroughly enjoy staying here and will always come back!! This hotel is a service apartment type. Our room consist living room and small kitchen area which made our stay much more convenient and comfortable. Decent hotel with decent space. Convenient location. Perfect place to stay in Shanghai especially you plan to stay more than just few days. The only thing is the staff at lobby area are lack of friendliness. No smile nor hello when you walk by. Location is the best. Love small kitchen I cook dinner for myself with noodle and vegetable soup. Very strong new paint smell on the 5 and 6th floor. Had to ask to be moved to a different floor. 15th floor water pressure was really low. Had to move again to the 10th floor. The hotel is in a good location. Friendly staff and very clean + comfortable room. The only one thing is the breakfast was just soso, not much choices. The service apartment is better than the hotel room. Spacious and convenient! We had to change room once due to the smell of the paint. The front desk staff was nice! The apartments are a great alternative to a hotel. I got great price for the studio room I had that provided me with everything I needed for my stay. Did not really use the kitchen for the length of time I stayed, but it is nice to know its there if you want it. Staff was great and the location ideal. Subway and Nanjing Road only a short walk away. Liked having wood floors as carpets are not always well maintained in Chinese hotels. Would stay again. I stayed at this property twice in two short stays in Shanghai between a trip to Nanjing. The location is great near People's Square and Nanjing Road. I have stayed in several different hotels in Shanghai on numerous trips. I would have no hesitation about returning to this property again. It is great value for the rate I paid compared to some of the hotels I have stayed in. Breakfast was good and the staff very accommodating. Perhaps the best was having a laundry in the complex with an attendant who would do your laundry and bring it to your room at a very reasonable rate per load, compared to single piece pricing in most hotels. An easy short walk to the People's Square subway stop and Nanjing Road for shopping made this a perfect place to stay. Loved the hardwood floors also as hotel room carpets are not always well maintained in China. I was trying to decide between Green Court and Marriott and MArriott was $320 and Green Court was less than a hundred so I initially had my doubts about how legit Green Court was. Anyway, I took the risk and boy how happy I am! it was a gian two bedroom suite with kitchen an a gorgeous look of Shanghai. I think for the price the deal was a steal. Don't wait any longer and book at this hotel! you won't regret it! Stayed two nights in May. Great location, sits right in the center of the city and just one block away from the famous East Nanjing Road. The staffs are very friendly and helpful. Strongly recommend it. I have stayed in several apartment hotels in Shanghai. This is the cleanest one. Be aware that the photos for this hotel are absolutely NOT from this location. I was expecting the hotel I saw in the photos, but didn't find it when I arrived in Shanghai. Needless to say, I was disappointed by that. This hotel is fairly average in terms of its amenities. Wi-fi is available in the lobby, but not in the rooms. Rooms have wired Internet which worked rather well. I used their onsite laundry service and it was excellent. The hotel breakfast was good and included a different variety of Chinese and western foods each day, including porridge, eggs, fresh fruit, pastries, meats, noodle and/or rice dishes, etc. If you love coffee, there's a Starbucks about 100 feet down the street. The rooms are kept clean, include a kitchenette, a safe that will hold a 15" laptop and an iron and board. The beds are stiff, but I was able to sleep. The rooms look nothing like the fancy photos would have you believe. The location is fairly centralized and is in a safe area. If you don't mind a walk, you can take yourself over to the Bund or to Xintiandi for shopping and good eats. Otherwise taxis are right outside the hotel. Within 100 feet of the hotel you'll find a restaurant, a bank, Starbucks and a mini market. The staff are friendly and willing to assist you with anything. The front desk staff speaks English and will gladly translate between you and non-English speaking staff members or even taxi drivers. I would recommend this hotel to anyone provided they have accurate facts and photos before booking. Nanjing road (4 mins walk from the hotels doorstep) is a breathtaking shopping mecca. Take advantage of your location and stay out late - its ok to sleep in, nothing opens until ten. Go for the sights and incredible people watching opportunities. Daily, a man in a sequined jacket plays a sax off a French-style balcony and people dance in the street. Dancing and singing goes on at all hours, but especially at night. But resist the shopping urges unless you don't mind paying premium prices for poor construction (I noticed everything - even knockoffs - are low quality compared to Beijing). Back to the hotel itself, the short walk to Nanjing Road (and the nearby metro stop) does go through a slightly dodgy area at night, but I after a few days I realised you can shortcut through a well-kept walkway belonging to the (GORGEOUS) five star hotel next door. The staff are fine, no concierge but friendly enough. Service reflects more a services apartment (they call it 'apart-hotel?') than a hotel, but thats fine. Breakfast was edible. The bed was very comfortable. Bathrooms are large enough to hand-wash clothes if you need to, also they have a laundry service and a launderette nearby. Room service was a little overzealous and non-English-speaking and once I forgot to put the do-not-disturb sign up and they came back every 5 minutes and then called me repeatedly until I got out of bed and put the sign on the door - lesson learned - but that was my only poor experience and mostly my own fault anyway. The overzealousness did translate to their work ethic, my room was spotless every time and they even folded my clothes. When I arrived the hotel did not have my double room available so they gave me a free upgrade to an absolutely gigantic apartment which was larger than my home. Huge balcony, bathroom, kitchen, bedroom, and separate living area. Decor was nothing spectacular but clean and without the tacky additions I've seen in other hotels (no blue glittery fake flowers here). All in all a wonderful hotel I will be sure to book every time. I do not usually write reviews but I felt they deserved it. 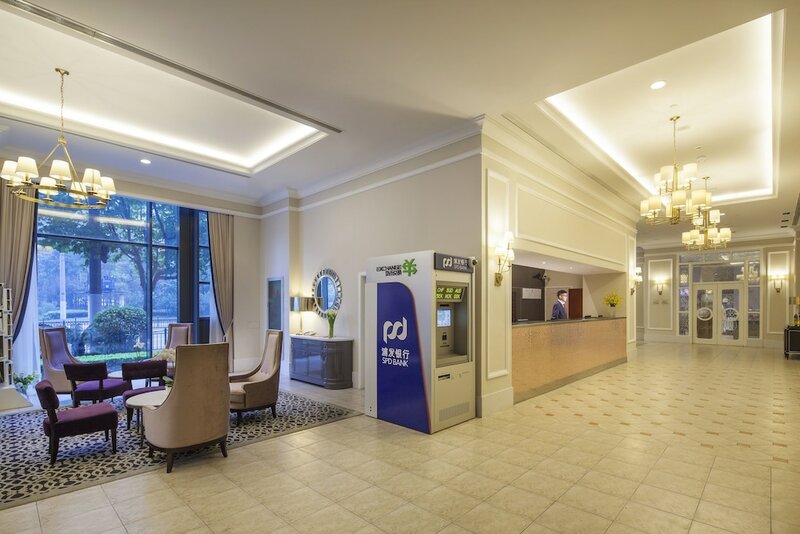 Located in Downtown Shanghai, Green Court Residence City Center, Shanghai(Original name: Green Court Serviced Apartment-People’s Square) is within a 5-minute walk of Nanjing Road Shopping District and within 15 minutes of other popular attractions like Shanghai Museum. This 4-star apartment building has 260 guestrooms and offers free in-room WiFi, a fitness center, and a 24-hour business center. For your convenience, a buffet breakfast is served each morning for a fee. Each apartment is air-conditioned and features a kitchenette with a refrigerator and a microwave. An LCD TV comes with cable channels and a DVD player, and guests can stay connected with free WiFi and wired Internet. Beds sport premium bedding and the bathroom offers a hair dryer and free toiletries. Other standard amenities include an iPod dock, free bottled water, and a safe. Guests of Green Court Residence City Center, Shanghai(Original name: Green Court Serviced Apartment-People’s Square) enjoy a fitness center, free WiFi in public areas, and a 24-hour business center. If you drive, self parking is CNY 30 per day, and there's also limo/town car service. The front desk is staffed 24/7 to help with dry cleaning/laundry, securing valuables, and luggage storage. Additional amenities include a computer station, laundry facilities, and a porter/bellhop. Thank you for having taken the time to share your stay experience with us! Hope to have the opportunity of welcoming you back to serve you better. Thank you for having taken the time to share your stay experience with us! I am sorry to hear that cleaning was not up to your expectations, and have shared that with the relevant team members to ensure immediate attention.Thank you for pointing it out and giving us the opportunity to address it. Hope to have the opportunity of welcoming you back to serve you better. Thank you for having taken the time to share your stay experience with us! I am sincerely sorry for the inconvenience caused with the WIFI. And sorry for not having been able to provide a fully satisfactory stay this time and hope to have the opportunity of welcoming you back to serve you better. Recreation features at Green Court Residence City Center, Shanghai(Original name: Green Court Serviced Apartment-People’s Square) include a fitness center. The preferred airport is Shanghai (PVG-Pudong Intl.). Please note that early check in is subject to a fee of up to a full nights stay. For more details, please contact the property using the information on the reservation confirmation received after booking. The apartment can refuse certain bookings for the purpose of group events or parties, which include pre-wedding stag/bachelor and hen/bachelorette parties.